Jerusalem - The Women of the Wall activist group clarified on Wednesday that while it supports the plan being drawn up by Jewish Agency Chairman Natan Sharansky to create an egalitarian prayer area at the Western Wall, it may not actually use the new section for its prayer services. In a landmark ruling last week that upheld an earlier decision of the Jerusalem Magistrates Court, Judge Moshe Sobel ruled in the Jerusalem District Court that women who wear prayer shawls, tallitot in Hebrew, at the Western Wall plaza do not contravene “local custom” or disturb the public order, and should not be arrested. WoW Chairwomen Anat Hoffman stated on Wednesday that the group believes the Sharansky proposal to be a very important step for religious pluralism in Israel but that until it was fully implemented the group would continue to conduct its monthly prayer services at the women’s section. Hoffman would not be drawn on what the group would decide once an egalitarian section is finally in place but said that WoW would not abrogate its right, granted by last week’s court decision, to pray in the current women’s section according to their customs under any circumstances. “The full implementation of Sharansky’s plan is at the moment still an imaginary scenario, we’re focusing only on May 10 [the date of the next Jewish New Month and WoW prayer service]. We’re not sure what will happen once the egalitarian section is completed,” Hoffman said. A spokeswoman for the group reiterated that the egalitarian section would have to have the capacity for a women’s-only area for this to even be a consideration. 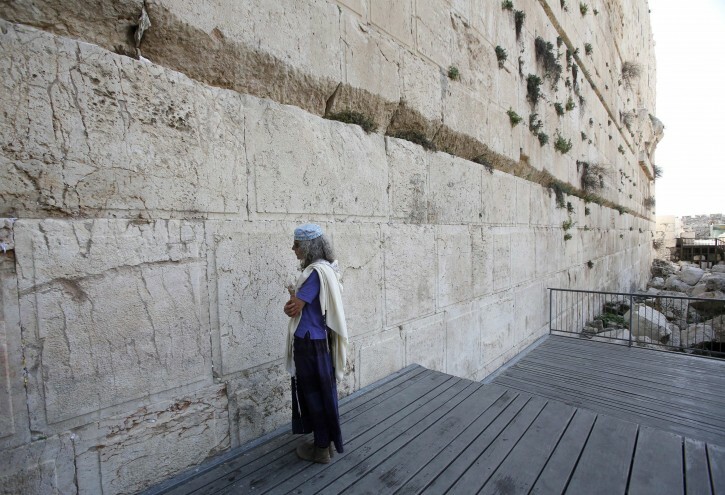 “Orthodox women have been very important component of Women of the Wall and it would be wrong for us to assume something now that would hurt Orthodox women in the future,” she said. Until now, the police have enforced a 2003 ruling of the Supreme Court and directives from the Ministry of Justice which upheld the Regulations for the Protection of Holy Places to the Jews, dating from 1981, which forbid performing religious ceremonies that are “not according to local custom” or that “may hurt the feelings of the worshipers” at the site, where local custom is interpreted to mean Orthodox practice. These regulations and their interpretation have been the legal basis for the regular arrests of women for performing Jewish customs at the Western Wall usually practiced only by men in Orthodox Judaism. But last week’s ruling means that, in theory, participants in Women of the Wall prayer groups who wish to wear prayer shawls (tallitot), tephillin, and perform any other Jewish custom not usually conducted by women in Orthodox practice, may legally do so and not get arrested for so doing. The Attorney General’s Office is expected to issue an updated directive on what will be accepted practice at the Western Wall some time before WoW’s May 10 prayer service. The WoW spokeswoman added that the group would be carry out a Torah reading at the service and said the group was exploring ways to read from a Torah scroll. It is not possible to bring a private Torah scroll into the Western Wall plaza and Rabbi of the Western Wall Shmuel Rabinowitz has refused to permit WoW the use of one of the scrolls donated to the site on the grounds that they were donated in the understanding that they would be for traditional Orthodox usage only. Until recently, WoW would read from the Torah at the Robinson’s Arch prayer area adjacent to the Western Wall plaza which was created after the 2003 Supreme Court ruling. The area did not satisfy the demands of WoW for equal prayer rights at the site, claiming that it was not part of the main plaza and lacked the proper amenities for prayer services. “Boston - Dias Kadyrbayev was driving back to his apartment when he got a call from a college buddy. A clearly anxious Robel Phillipos told him authorities had released...” Boston - Texts, TV, Then Trouble For Bombing Suspect's Pals	“Brookln, NY - Dozens of members from the Orthodox community of Park Slope gathered Monday to attend the ribbon-cutting celebrating the opening of the William and Betty...” Brooklyn, NY - IN PHOTOS: Park Slope Celebrates Grand Opening Of First Kosher 'Mikvah"
This proves that these woman are out for trouble. She is correct. According to the court ruling, women are free to daven as they wish in the varbeshe section in front of the kosel which is separated from the main section by a mechitzah. The women are not telling the men that they must wear a Turkish Talis or insisting on inspecting the retsuot to be sure the black is not peeling off. If you've been to the kosel on a humid August afternoon, you would certainly question how many of the Chareidim understand personal hygiene 101. Likewise, the men should leave these women alone and let them daven in accordance with their own hashkafah, even though we don't agree with it. They are nihilists. They don't want an egalitarian section. They want to destroy anything that acknowledges Hashems dominion over human desires, like the different roles and responsibilities for men and women that Torah teaches us. This shows that their main concern is not having the freedom to worship as they please, but rather to impose themselves on traditional Jews. What does the Torah say about parading around in a fancy talis? I seem to remember this guy named Korach who showed off his fancy talis. That did not turn out well for him. I can assure you that 30% do keep Torah and Mitzvos the same way you do. Sharansky and company need to create a separate space for Women's Tefila as well as any egalitarian space they opt for. I don't agree with women's Tefila, but they do not violate Any Halacha. Women are permitted to wear a talus it tefilin and can read from a Torah. They have rabbinical direction just as you guys do and as long as they are not disrupting anybody else they should be given their space. The egalitarian thing is another matter. It is contrary to Halacha and bad for the Jews. Even so, for the Chareidim who complain about army events and the like taking place at the Kotel, the new egalitarian area can be the "tourist" area. the term haskafa means that one follows the torah in aspecific way. this is NOT torah!! !